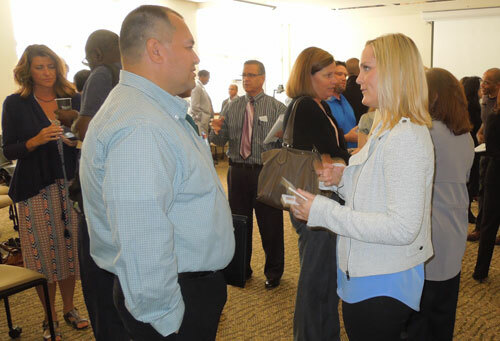 Members and guests networking at the September 2015 Salem Capitol Connections meeting. Salem Capitol Connections provides Oregon entrepreneurs with opportunities to connect with public and private entities that lead to sustainable business relationships and opportunities. Salem Capitol Connections facilitates networking and business opportunities. Salem Capitol Connections provides opportunities for small business owners, emerging businesses and entrepreneurs to access information, assistance, training, and seek contracts from larger businesses, corporations and public sector agencies. Small businesses will have the opportunity to network with and connect with each other, larger businesses, government organizations and other local agencies. Salem Capitol Connections is intended for the Willamette Valley business community, emerging small businesses, minority businesses, women-owned businesses, larger businesses, corporate and government procurement representatives and other interested individuals. 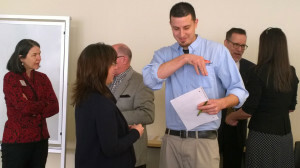 Terin Sinclair from SERVPRO reaches for a business card at a recent meeting. Networking is a big part of Salem Capitol Connections. Invited guest speaker(s) formally introduce and promote their company or organization’s procurement programs. Small business owners will have the opportunity to introduce themselves and promote their companies to the larger public and private sector businesses and organizations. Networking Component – participants will have the opportunity to meet other attendees, distribute their business cards, company brochures, and other materials to promote their businesses. Question and Answers – Technical questions regarding contract opportunities will be addressed.